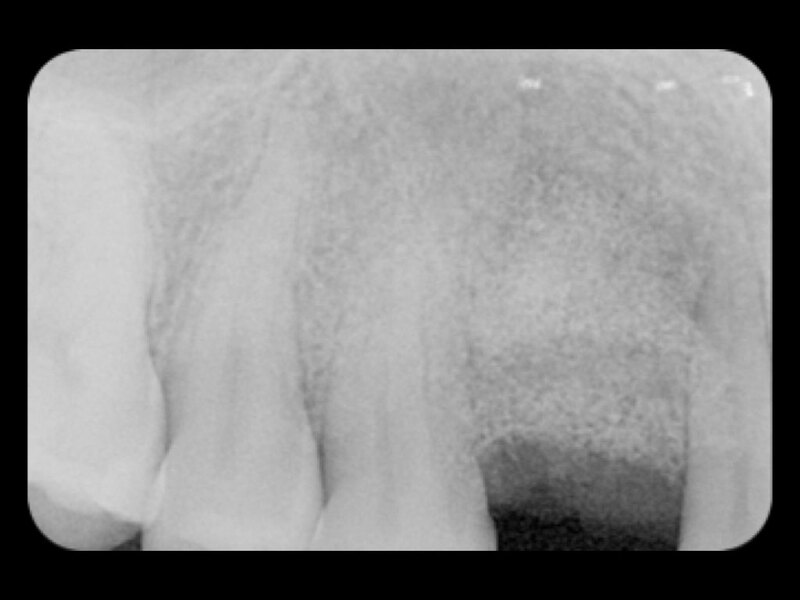 A 30-year-old female patient who lost tooth #13 FDI (#6 US). She reported the traumatic extraction of the canine, which resulted in a significant vertical bone loss of 3 mm and an advanced horizontal lingual defect. After the extraction, a bone graft and an implant insertion were attempted: both graft and implant failed. 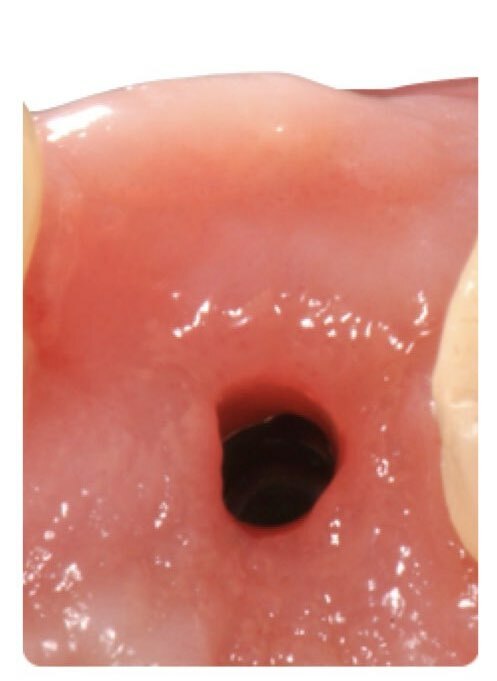 The lateral incisor exhibited a broader periodontal ligament (PDL), mobility class II and periodontal attachment loss up to 9 mm. The surgical solution was the removal of the remnants of the failed bone graft, guided bone regeneration (GBR), implant insertion, and mucogingival plastic surgery to boost the biotype. 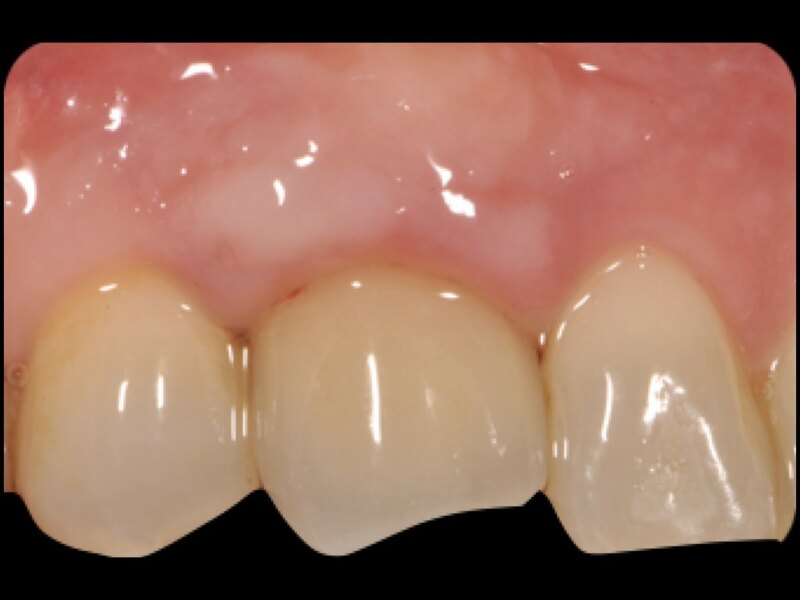 A lithium disilicate (IPS e.max®) single crown restoration was used in this case. Initial clinical situation. 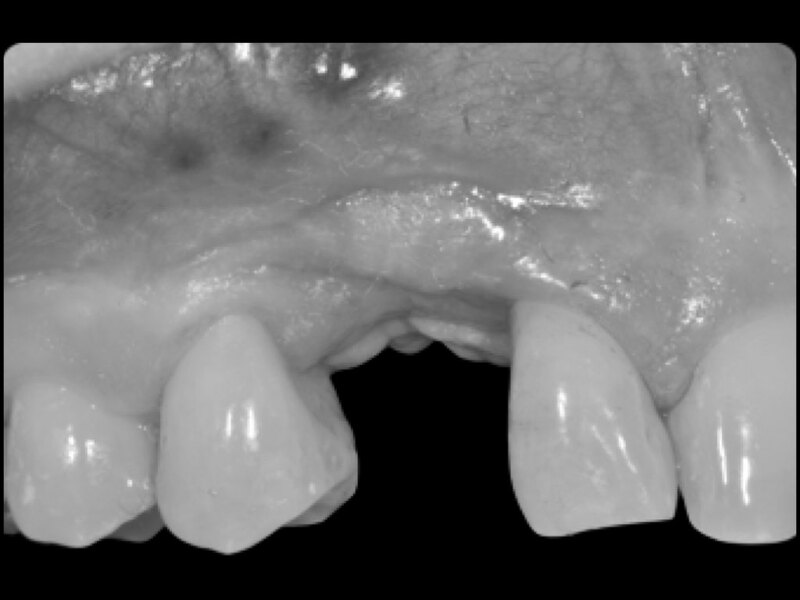 The pre-operative buccal view is showing a missing canine associated with mucogingival deformities as the results of a traumatic extraction of the retained canine. A bone graft was attempted as well as an implant insertion: both bone graft and implant failed. Diagnostic phase: 3D Soft and hard tissue planning Interpret: The surgical analysis of the site is showing a flat mucosa and a wide embrasure on the distal and mesial aspect of the canine: the chances to obtain a papilla are very much unlikely. The surgical analysis of the sites is showing the recessions on the adjacent teeth and the missing natural convexity of the canine. 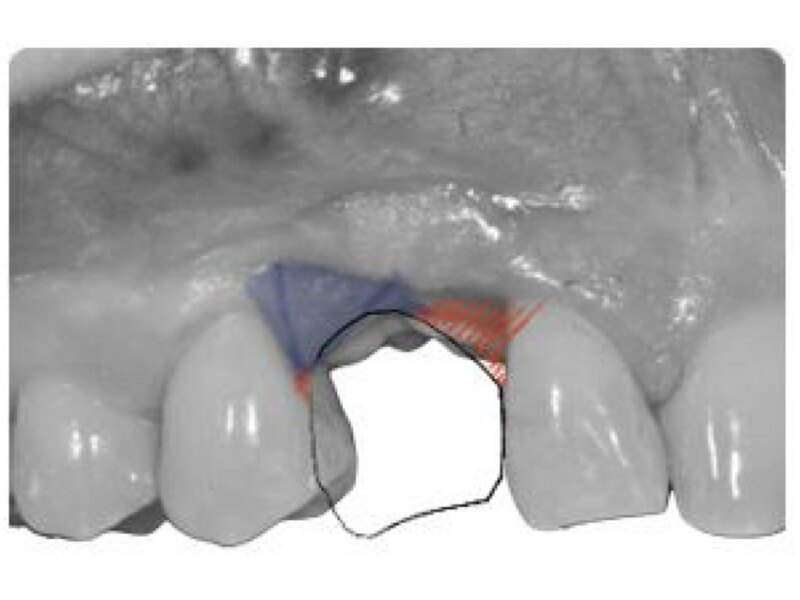 3-D Soft (blue) and hard (red) tissue planning. 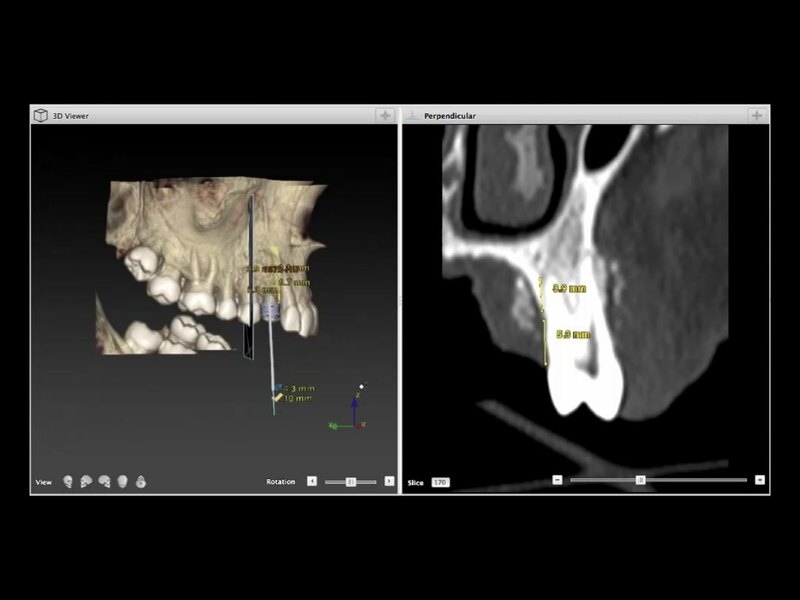 The 3D NobelClinician reconstruction is showing the remnants of the previous bone graft that did not integrate and a vertical bone loss of 9.7mm on the lingual aspect of tooth #12 FDI (#7 US) as well as the widened pdl. The entrance of the furcation mesial to the premolar #14 FDI (#5 US) is very close to the residual bony crest. The peri-apical radiograph (high quality image) without indications. Single-tooth ; bone resorption. Surgical procedure: full thickness flap and Guided Bone Regeneration (GBR). The peri-apical radiograph augmented with indications by the author is showing advanced vertical bone loss (white arrows) adjacent to teeth with a damaged periodontium (red arrows). A full thickness flap is raised to visualize the defect. The incisions are performed to preserve the adjacent papillae. A mixture of 50% autologous bone, harvested from neighboring areas, and 50% of biomaterial is inserted into the defect. A resorbable collagen membrane is stabilizing the graft. Interpret: The membrane positioning is particularly difficult since the bony defect is completely localized on the palate. Surgical procedure: full thickness flap and GBR. 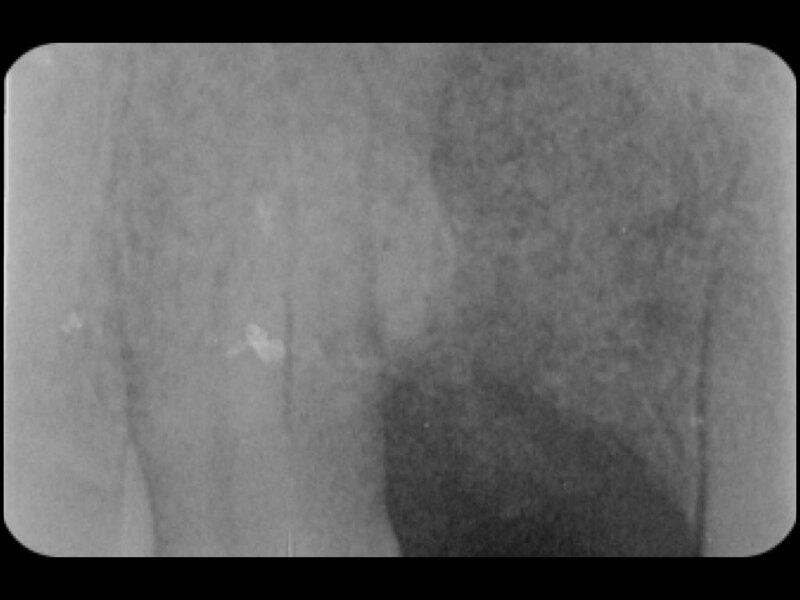 Post-op radiograph is showing the depth of the defect. 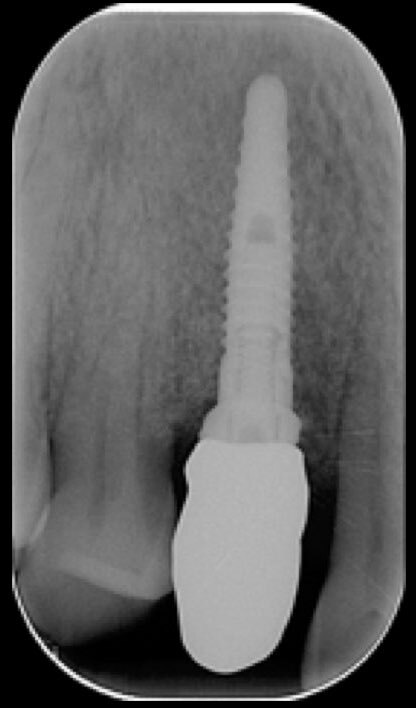 Post implant placement radiograph. A NobelReplace CC Groovy was placed. Surgical procedure and outcome: full thickness flap and GBR. Peri-apical radiograph post delivery of the final restoration. A NobelReplace CC groovy was placed. Post implant placement radiograph and peri-apical radiograph post delivery of the final restoration. 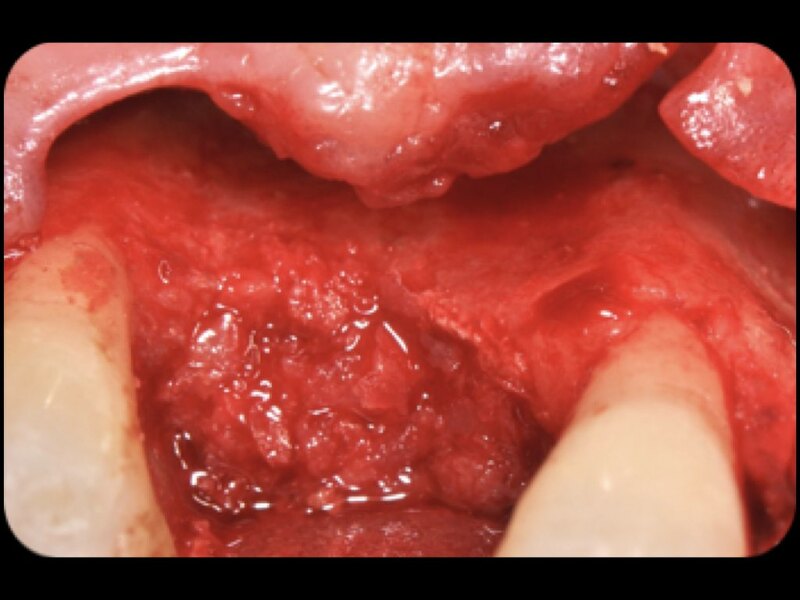 Transpositional flap is performed to boost the biotype with a minimally invasive approach: the buccal band of keratinezed mucosa is increased and a slope of 10 degrees will give the optical illusion of the missing papillae. Final restoration is delivered. The embrasure is left wide to allow the soft tissue to migrate coronally. 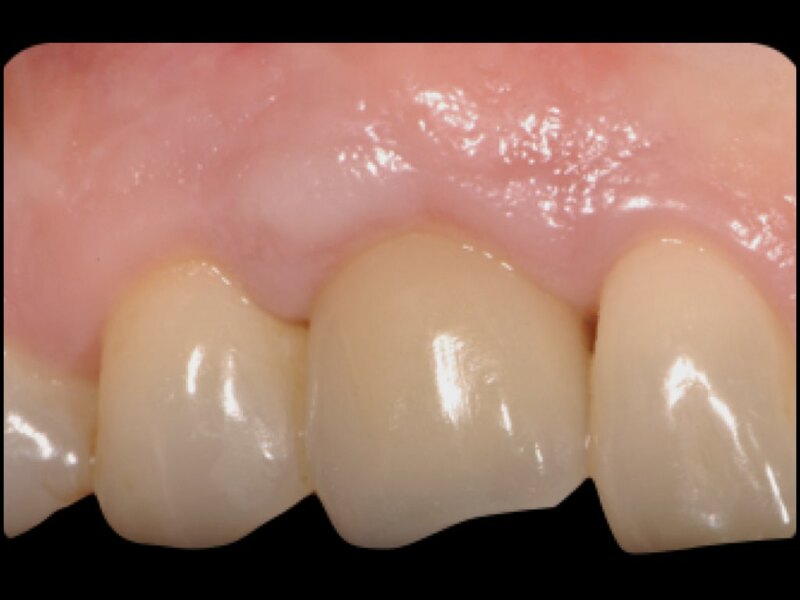 Final crown after 18 months the creeping attachment of the peri-implant soft tissue is evident. 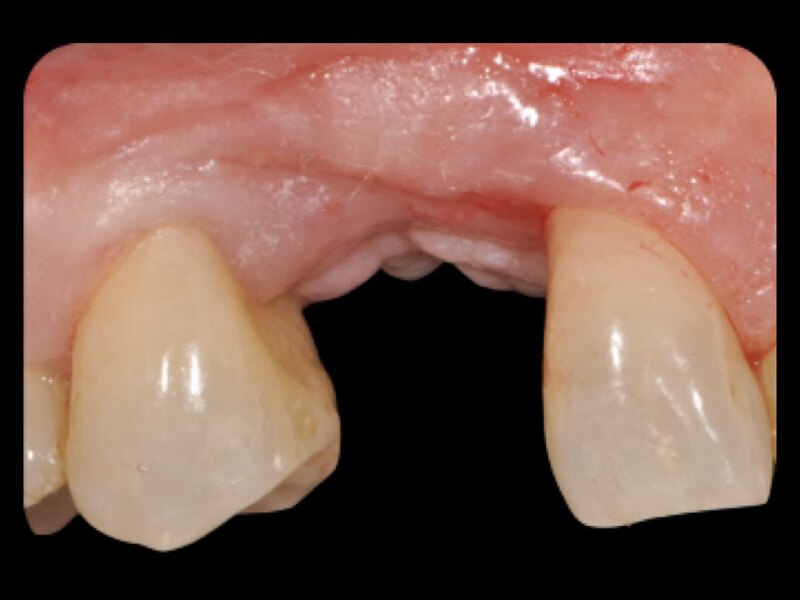 Surgical procedure and outcome: final crown delivery. After 18 months the creeping attachment of the peri-implant soft tissue is evident. 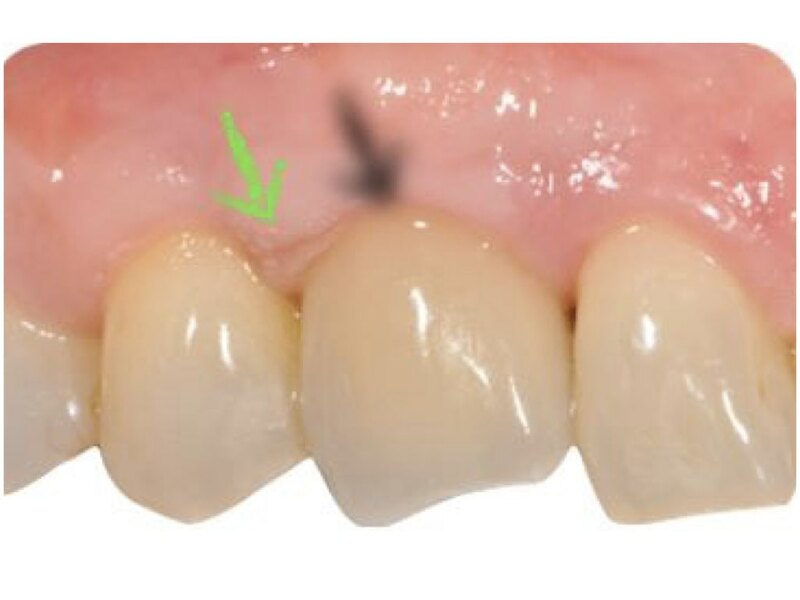 The green arrow is showing the line between the original soft tissue level and the newly formed papilla. After 4 years the peri-implant soft tissue has increased in volume and it has migrated coronally. Three years post-op: the line has disappeared due to the natural collagen turnover. 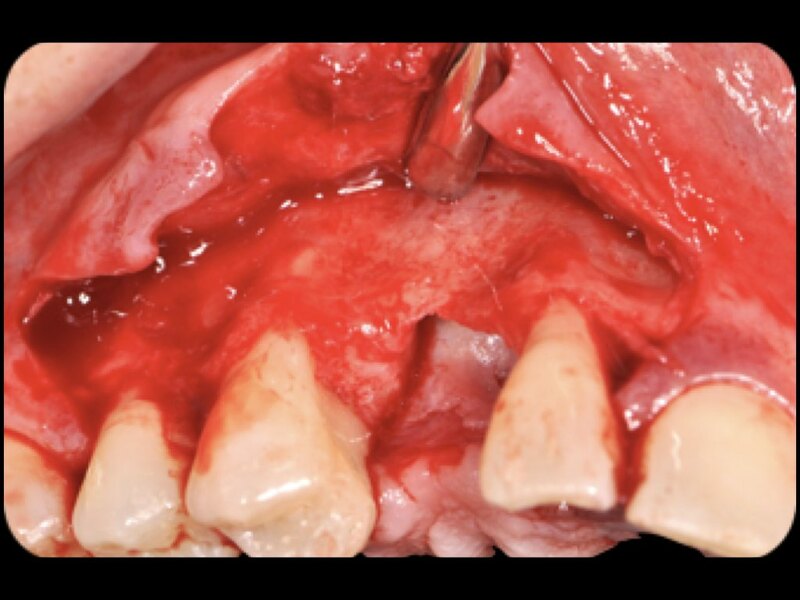 Final outcome: The pre-operative intra-oral view of missing canine opposed to the 4-year follow-up intra-oral view. What bone graft material did you use and what did you use to hold the graft? What were the occlusal contacts on tooth 13 after the crown installation? Hello dr. Great job, here. I’d like to know more about the occlusion on that tooth, #13. 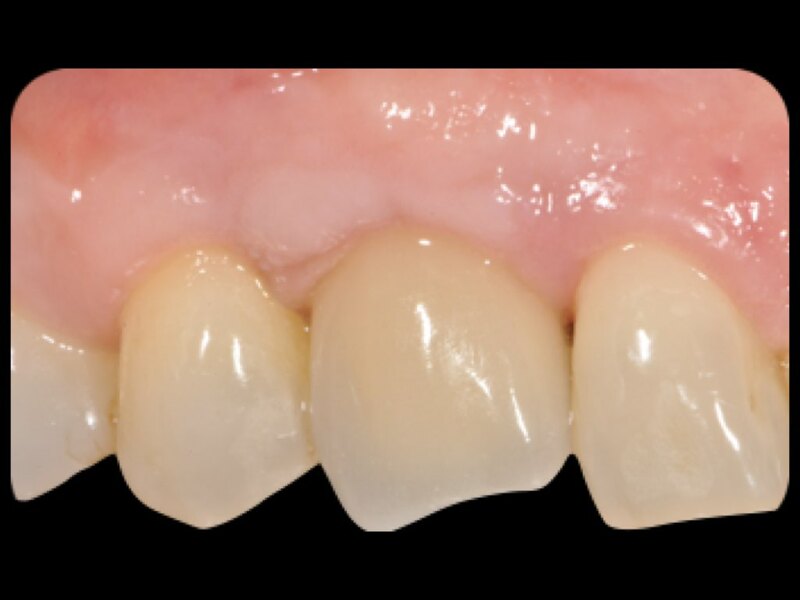 After you installed the final crown and after 4 years follow-up. Thank you. You mentioned you did mucogingival plastic surgery to boost the gingival biotype. What did you do and when? You mentioned you did mucogingival plastic surgery to boost the gingival biotype. What did you do and when? I am also curious how you resolved the 9 mm of attachment loss you had on the mesial of the lateral incisor. Some would have removed #7, included that site with the GBR and constructed a two unit bridge with #7 being a cantilever. Did you consider that in your treatment plan? 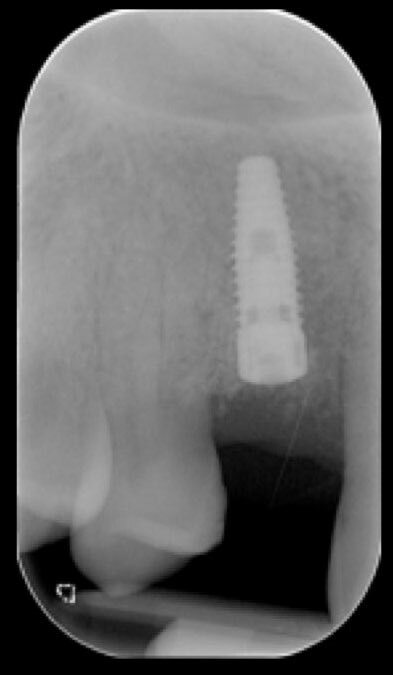 How did you resolve the 9 mm of attachment loss on the mesial of #7? Did you consider removing it and doing a cantilever bridge? 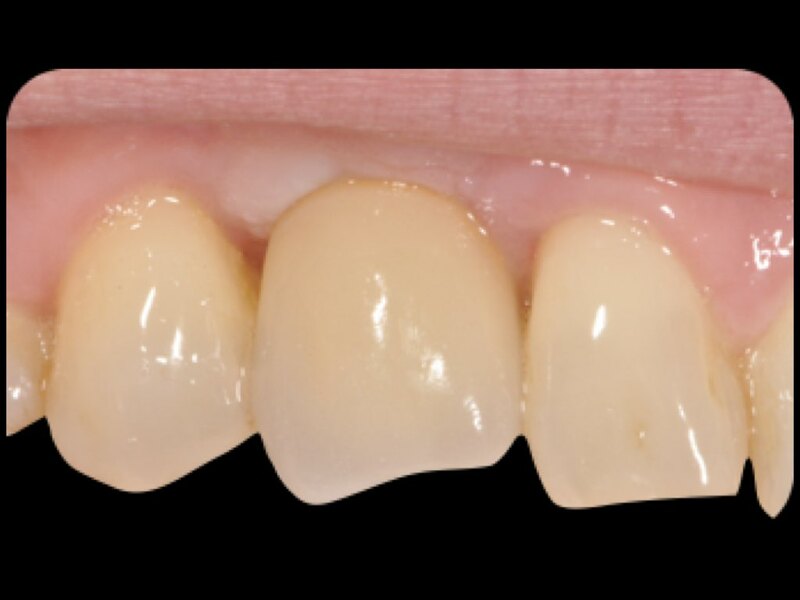 Why did you used litium disilicate crown and not a zirconium one? Why did you use uncomon form for this crown? Why did you change the top of this tooth? 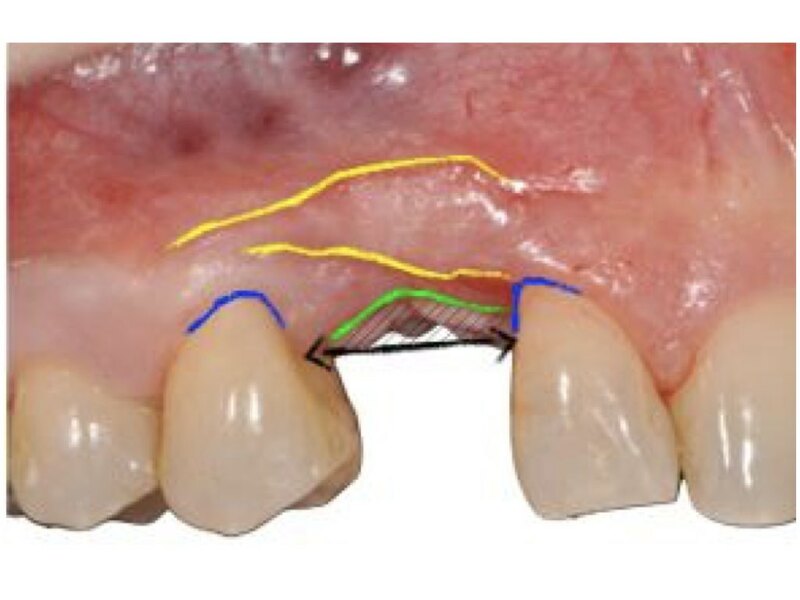 I would like to know what causes a &quot;creeping attachment&quot; and will the gingiva eventually remodel? ¿Realizo controles radiográficos durante los seguimientos? 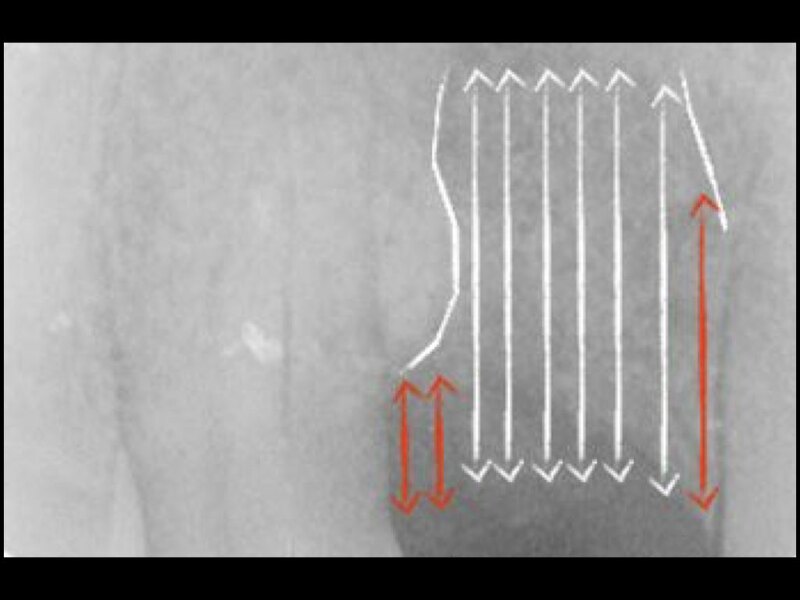 Schropp L, Wenzel A.Timing of single implant placement and long-term observation of marginal bone levels. Eur J Oral Implantol. 2016;9(2):107-22. Kan, J.Y. et al., Facial gingival tissue stability following immediate placement and provisionalization of maxillary anterior single implants: a 2- to 8-year follow-up. 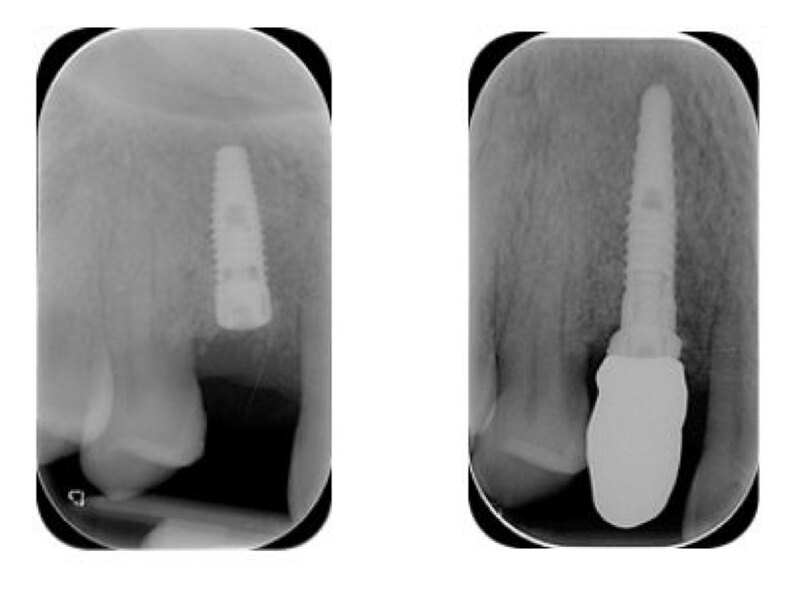 Int J Oral Maxillofac Implants, 2011. 26(1): p. 179-87.